« Were the Broncos Looking to Move QB Peyton Manning to Houston This Offseason? 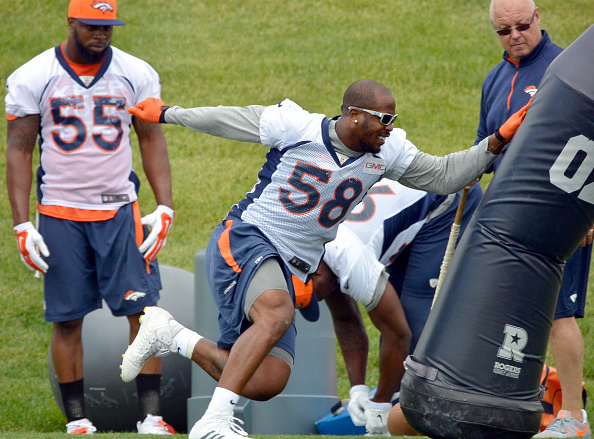 Pro Bowl linebacker Von Miller is one of six Broncos who will become an unrestricted free-agent at the end of the 2015 season. Miller said he has altered his eating habits this offseason. He has shunned drinks with sugar in them and is poised “for big things because I feel great, better than I ever have,” Jeff Legwold of ESPN.com reports. Believe it or not, a current contract situation is worth monitoring here in regards to Miller. DT has yet to sign his franchise tender, which would pay him close to $13M for 1 year. He wants a long term contract, and Denver may be happier to have him play on a one year franchise tag and let him go next season, especially if Manning retires at season’s end. Denver would have Latimer and Sanders, which would make a good pairing (assuming Latimer lives up to the hype), and would allow Denver to allocate funds to Malik Jackson and if they can’t work out a deal, put the franchise tag on Miller. If Denver is able to work out a long term deal with Miller before Thomas, then I think Denver would be in a good spot. They can franchise Thomas, and shop him for 1st and 3rd round picks. A team may even give up 2 1st rounders, but remember, the last two draft classes have been rich with WR talent, and that should bring his price down just a little bit in a trade. DT is an extreme, rare talent, but you have to keep in mind, there is a thing called the salary cap. Also, the difference between Mike Wallace ($12M annually) and Calvin Johnson ($16.2M annually) is significant. It may take a 5 year, $75M deal with $45M in guarantee’s to wrap up this contract, and is that too rich for Denver to pay? And think about this, who would you rather have, Miller and Jackson or DT? This is probably a decision the head honchos in Dove Valley are pondering. The choice is simple in a Manning-less Denver, you have to pay the pass rushers, which is arguably the 2nd most important position behind Quarterback. And I’d sign Malik Jackson now before he has a double digit sack season. He will get more expensive as the season goes along. What do you think Broncos fans, Miller and Jackson or DT?